Some people have spouses who love to game with them, but for most of us, we’re always on the lookout for a game that might entice our significant other to join us in this hobby. For many people, designer Reiner Knizia’s Lost Cities is the quintessential Spouse Game: It’s easy to teach, it’s 2-player only, there’s a decent amount of luck, and there are interesting decisions throughout. If you’ve read our review of Reiner Knizia’s Battle Line, these mechanisms will be very familiar: play a card, and draw a card. The theme is paper-thin, but every little bit helps when it comes to getting your wife or husband playing. 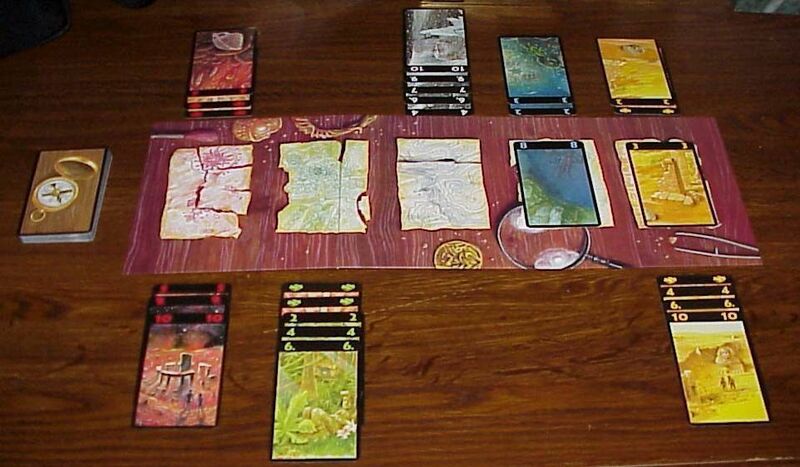 You’re heading up a series of expeditions looking for fabled “lost cities.” The game comes with a small board, and a deck of 60 cards—45 of them run 2 through 10 five colors (or destinations), and then each color also has three Investment cards. You start the game with eight cards. On your turn you will play a card—either down to one of the five expeditions in front of you, or into the communal discard pile for the color. Then you draw a card, either from the facedown deck or the top card from one of the color discard piles. You’re trying to get as many cards into as many expeditions as possible. The catch is that once you place a card for an expedition, the next card you play has to be higher than the last one played. It doesn’t have to be the next card in sequence; it just has to be higher. But the numbers only go two through 10, so if you start on five, you only have five more cards you can play—and that’s only if you’re able to draw those cards! Since you’re forced to play a card each turn, sometimes you just want to delay having to start one of your expeditions until you can get some small numbers in that color, so you ditch a card onto a discard pile. You run the risk that’s just the card your opponent needed, but sometimes it’s a necessary evil. Another twist is those Investment cards I mentioned earlier. There are three in each color, and you have to play them at the beginning of an expedition. You can play all three if you’re lucky enough to draw them—and brave enough to play them. That’s because the first one doubles the value of the expedition at the end of the game; the second one triples it; and the third one quadruples it. One other small rule is that there’s a bonus of 20 points for any expedition that has eight or more cards in it—including Investment cards. The game ends as soon as the draw deck runs out. You add up the points in each expedition, subtract the 20 points, add the 20 points (if applicable), and multiply (if applicable). The game suggests playing three rounds, and since the rounds are short, it doesn’t take long at all. 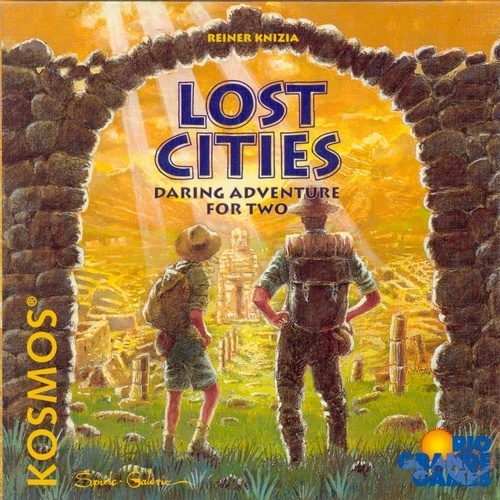 Lost Cities is part of the Kosmos line of 2-player games. If you play a lot of 2-player games, I highly recommend checking these out—especially Jambo, Odin’s Ravens, The Lord of the Rings: The Confrontation, and Balloon Cup. The artwork is colorful and evocative. The cards are oversized, and despite the fact that they have black borders, they don’t seem to be showing much wear. Lost Cities is a very good 2-player game, and if you’re looking for the game to hook your spouse, this might just do the trick. Check back later in the week for our review of Lost Cities: The Board Game, which ramps this game up a notch. I actually picked this one up specifically to play with my sister in law when my brother doesn’t want to game; it’s nice to have a few simpler 2-player options.